RestSharp is a .NET REST client that can be downloaded and used to easily serialize and deserialize both XML and JSON. If necessary, it will used fuzzy element name matching to map from the original JSON object to C# so that if an exact property name match isn't found it will use the following precedence to deserialize the data. Using Xamarin Studio, I've included RestSharp from the component store in my C# project. Here are a few simple examples of how to deserialize JSON into C#. //people.FirstName will now be "Eileen"  people.LastName will now be "Dover"
In the above examples, the deserialization happens synchronously, so that the application will wait until a response is received before continuing. RestSharp can also create asynchronous processing so that the application will continue execution without having received a response, but will handle the response from the web service when it arrives without holding up execution of other program logic. This is especially useful to avoid blocking the UI thread in a mobile app while waiting for the web service and run the risk that the OS will terminate your application. In this post we'll modify the ListView to use the ActivityListItem style. ActivityListItem is another built-in view which will display an image and a single line of text for each row. The People class will now have a property added that provides the image name to be displayed. 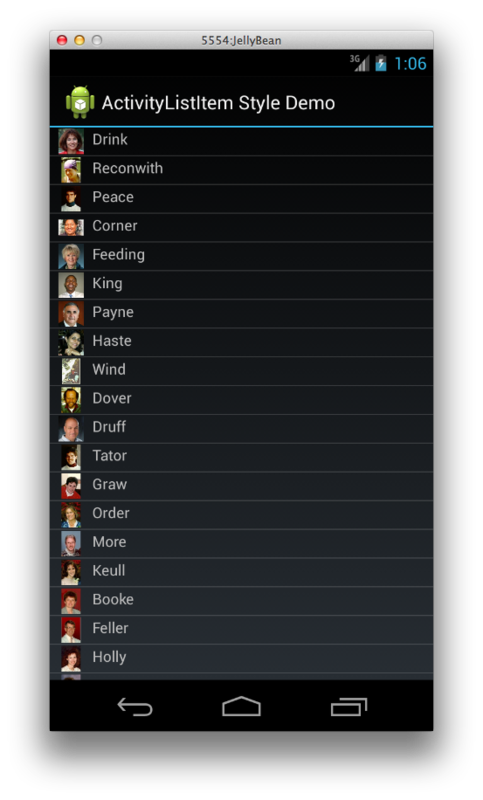 The helper method which provides the data will populate a List of People objects with the values we want to display. (In a later post, we'll modify this to pull the data from a web service rather than hard-coding it). The images are stored in the images folder under the Assets folder in the project. Make sure to use a lower case "i"on the images folder or Android may not be able to locate it. 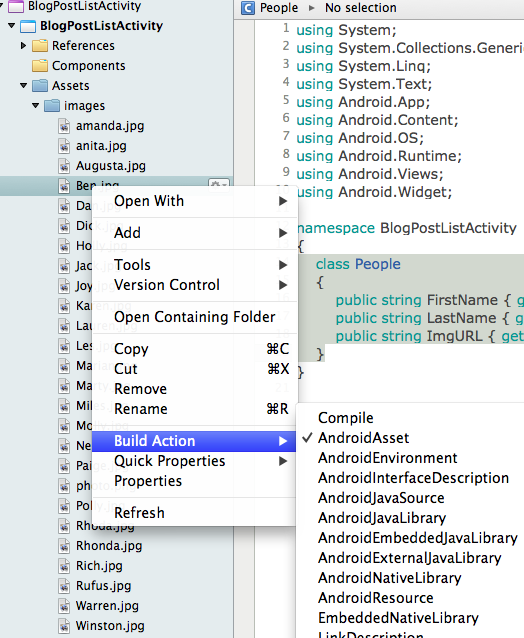 Also make sure that any images in the folder are set to build action: AndroidAsset by right-clicking on the image or the compiler will throw an error. AndroidAssets will be included in the package when it is compiled. In the data adapter PeopleAdapter.cs, layout style is set to ActivityListItem. In this style, only Text1 will have data, so we won't need the Text2 used in the previous examples. // otherwiser reuse the one passed in. GetImage.GetImageFromURL will be called from a static class to retrieve the drawable image from the assets and return it to be inserted in the row view. This method will also be used later to display the image in a full screen view so the calling Activity is passed in as the context. The new activity will retrieve the list of strings passed in the intent and populate a new AXML layout. It will also use the GetImage.GetImageFromURL created above to retrieve the image from the Assets/images folder. The following screen is displayed by the NewActivity when the corresponding row is clicked by the user.